Status: The DVD is being produced. In the meantime, everyone who has pre-ordered it can request to learn it over Skype, Google Hangout or otherwise. We will eventually release a downloadable video featuring all the basics so that one could learn it already without needing to remember it from the Skype sessions. The 'Pass' is a classic utility move which could be used as a control, force, false cut, color change and more. However, it usually is taught and performed in a classic, almost outdated and knacky way. The 'Practical Pass' fixes many of the errors, making it easier and more performable. Its principles could be added to other 'Pass' techniques you might already perform as well. Usable in all situations and for card magicians of all levels. Any deck of playing cards. Different kinds of passes, including but not limited to the 'Half Pass', 'Cover Pass' and 'One Card Pass'. Copyright ©2013 DarkSleightZ - It's eS productions. All Rights Reserved. this is a beginner level trick? But the pass is really hard though isn't it to master? just out of curiosity, how much is "enough orders"? Are we talking like 200 or 1000? 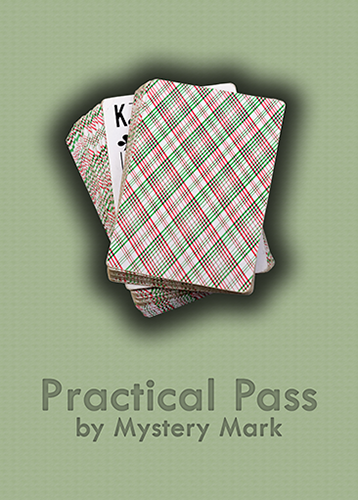 "The 'Practical Pass' fixes many of the errors, making it easier and more performable." Well, as stated we do have enough orders already, but it usually is considered to be in between 20 and 30 for that we can always pay for up to another 10 DVDs ourselves without losing much on it and we can be sure those will be sold eventually as well. Below 30, the costs we have to make per DVD would be too high. For that, a lot of our older DVDs were released in quantities of 30 as well. Mark showed me his passes through skype long time ago ! Hi, Is there any new information about this DVD. The masters will be sent to the DVD factory next week which means it will be available sometime next month and probably be sent out before the end of the year. Here's my review of this sleight, read it, now. Uhm just wondering...to who do I have to ask to show me on skype the pass?? At last. You're one of the very last to ask for it. You can reply to the e-mail, send me a PM personally, really doesn't matter. However, I've left you a message on Skype already. It's been a while since we had a post, so, I'll put some words out there. I really hope everyone has taken advantage of Marks excellent teaching and tips via Skype or any platform. I was taught the Practical Pass by Mark many months ago now (Not to mention the content of most of the other future releases), and have used it many times practically since then, and only have great things to say about it. It works excellently quick and silent on an off beat, with a bit of misdirection cover, or openly with its almost perfect angles. The only Pass I had the confidence to use before was a turnover pass, but the Practical Pass is very different, its just what the Hermann pass should have been from the beginning, and improves upon it in so many ways, it could be used by beginners. Not to mention it can be used to variate your turnover pass giving it the same advantages as the regular Practical Pass, its concepts can also be applied to the Classic Pass, improving that vastly too. It has significantly better angles, sound, speed and ease than the original, what's not to love? A note on the length of time involved with this project, I'm sure most of us understand the effort involved on Mark's behalf to produce the DVDs at such a high quality, in every regard. Its a lot to manage for such a small production team, plus several issues out of anyone's control, causing large setbacks. I only mention this as you can see posts even on this forum where people get Irate because of this issue, if you have any issue or complaint, in my experience, Mark has never had a problem contacting you personally or explaining anything, don't hesitate to ask, he is one of the most helpful people I've ever had contact with. I would like to also dedicate a paragraph of this post to thanking Mark and everyone else who's ever contributed anything to all the DSZ releases, they always offer the lowest prices, high video/audio quality, excellent formatting, design and editing, fantastic content (The best anywhere) and the friendliest, most helpful community out of any of this nature. Mark in particular has a lot of negative online history associated with his name (None due to any fault of his, mostly for being just too good at what he does), I've personally seen it across all platforms, here, social media, youtube, and a few other online magic stores/forums. He doesn't deserve this, and any people who still think in this way, just wait till you see the products! Thank you DarkSleightz, It's eS productions, and Mark! Hi,I'm interested in the Practical Pass,when will the DVD be available ? Read the description, it says June or July. But dont take that for granted, since Mark is very busy nowadays. BTW You can only get it from here. I was shown and discussed the PP with Mark the other day. My approach towards magic has grown to the concept of minimizing work to maximize performance. The PP is a control/force/cc/etc. without the similar pitfalls of related sleights helping to accomplish this. You can and will seem much more natural. Buy it, then get in touch with Mark and learn it. The DVD will be nice to have once it arrives (not having a visual reference readily available impedes the learning and practicing), but, anyone who performs often is missing out and possibly making their performances harder on themselves. For me, the Line Theory release and the PP release have (and will have) the most value as products currently available here. The magic from the overly-commercialized market is just that, a commercial, and no one likes commercials. I have no intentions to purchase from these retailers ever again. Respect is gained through the respect given to this art.